The second John Wick 3: Parabellum trailer will be released tomorrow morning. In effort to raise hype and awareness, Lionsgate has released a ton of new images and some teaser videos stating, "Everyone is waiting for John Wick." The stakes are high for Mr. Wick this time around as he finds himself on the run with a bounty on his head. The first trailer was an intense experience and not for the faint of heart. It is believed that the second trailer will be just as crazy. With a $14 million price tag on his head, Keanu Reeves has an army of killers on order from the High Table on his trail. John Wick 3 is going to see the character trying to escape New York before moving on to other parts of the world, but he really isn't safe anywhere. In order to stay alive, Wick is going to need some help, which is where Halle Berry's Sofia character comes into play. The fellow assassin is seen in one of the new teasers with her two Belgian Malinois attack dogs. Anjelica Huston plays The Director, who is a member of the High Table and, at one time a protector of John Wick. However, it doesn't look like she will be able to help this time around. She is shown in another teaser staring at what one can only assume to be Wick with a look of impatience on her face. The Adjudicator is another member of the High Table and she is played by Asia Kate Dillon. She too is staring off and waiting for the assassin in the John Wick 3 series of teasers. The other John Wick 3 teasers feature Laurence Fishburne as crime lord Bowery King, Lance Reddick is back as Continental Hotel concierge Charon, and Ian McShane as Continental Hotel owner Winston. Mark Dacascos plays assassin Zero, who has a personal vendetta against Wick. Much like all of the characters in the movie, we're all waiting for Wick too. Thankfully, the movie hits theaters in just a few months, which means that some early reviews should start pouring in very soon. 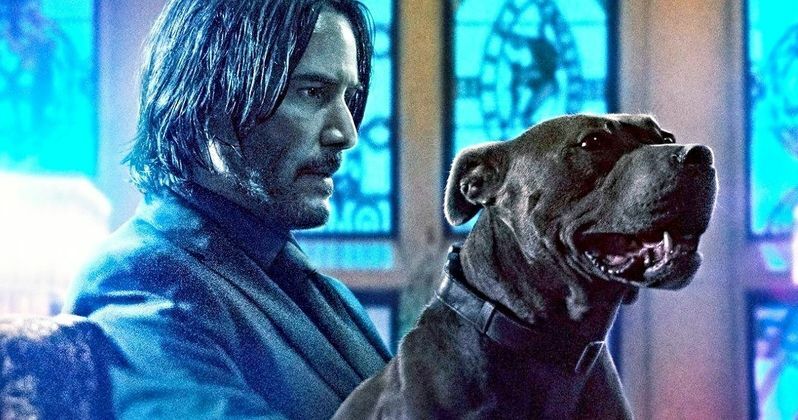 John Wick 3 director Chad Stahelski has teased that this might not be the final chapter in the franchise. The director and Keanu Reeves reportedly have enough ideas to keep the franchise healthy for a long time, but it will depend on how well the third installment does in theaters. By the looks of things, the movie will be a pretty big early summer blockbuster that will hopefully ensure that more movies are made in the near future. You can take a look at all of the new images and teaser videos for the latest trailer below, thanks to the John Wick 3: Parabellum Twitter account. The trailer officially drops Thursday, March 21st.